Rational Animal's "Gingerbread Homes" for Animals, an annual event hosted by New York-based animal welfare group, Rational Animal (www.rational-animal.org), showcased the creative confections of some of New York's top pastry chefs. Visitors stared in wonder at the edible works of high art created by these top chefs. The event was such a success that people have asked how they can make their own beautiful gingerbread house! Email Susan Brandt at sbrandt@rational-animal.org and ask for your "Mini Kit!" A $20 donation (plus shipping and handling) will have it on its way to your house. All donations go to the care of New York's homeless animals. This fantastic event five-day exhibition took place December 1-5 at the Dana Discovery Center in Central Park. The Dana Discovery Center is located right at the north end of the park at 110th and Lenox Avenue. In addition to the Gingerbread Homes exhibit, there were free educational seminars and workshops, a bake sale, raffle and lots of fun! All sales and proceeds from the event will benefit The Picasso Fund. 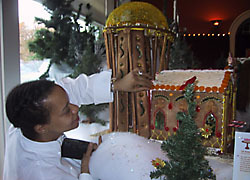 New York Tails was able to sneak in an interview with one of the Gingerbread Homes for Animals pastry chefs, Elisa Strauss, founder of Confetti Cakes, Ltd., in-between creations. New York Tails: You have a great story about how you came to be a pastry chef--originally a Vassar graduate of design, then working for Polo Ralph Lauren, where you got your big break not designing clothing, but a cake! How did this happen? Did you ever think your design background would take this turn? Ms. Strauss: I loved to bake since I was a little girl and I loved to design art work so it all just came together. I started making cakes for friends and family, and then while working at Polo I was asked to make Ralph Lauren's birthday cake, since everyone knew this was a hobby of mine! Next I made a cake for the famous shoe designer Manolo Blahnik. Gradually my business grew by word of mouth and a website. I never thought this would be my career, but life takes you on interesting journeys. New York Tails: Describe a typical day at your company, Confetti Cakes. Can you name some recent unusual requests? Ms. Strauss: There is no typical day! Every day is something brand new. Each of our cakes is custom made so I never make the same cake twice, especially our sculpted cakes. I'd have to say that we receive many different requests since we can make anything out of cake! (We just completed a life-sized marlin fish for a bar mitzvah.) We are often asked to recreate a favorite toy, game or animal for the groom (if it's a wedding) or for a special birthday! Ms. Strauss: I was inspired by frogs after seeing the fabulous frog exhibit at the American Museum of Natural History (just down the road from me). They (the frogs) are so versatile and I love the amphibian quality of living in both water and on land. They are also found in many different environments; my landlord found a bullfrog in the basement of another building. It's amazing-they are all over! I also find them beautiful. The many varieties, sizes, and colors they come in. My "Palace of Harmony" sounds grandiose but it is actually a home showing that humans are the ones to move into the environments that already exist. It shows my frog and his family living in a very nice home having to co-exist with the outside world. It depicts a flashy sign from Times Square as well as some trash to show the not-positive side of the human element. New York Tails: Do you think it's possible for both people and animals (particularly wildlife) to live together in relative harmony? Ms. Strauss: I would love to say yes but it would be a gradual process. Zoos have started, just started, to move in creating more environmentally-friendly habitats for animals. But as long as humans destroy animals' homes I am not optimistic. There always needs to be progress but as an animal lover I really feel for these beings that can't speak up for themselves. New York Tails: So many of your designs are very detailed: shoes, sushi, computers...what is the secret of building such detailed designs, and how long does it take to make them? Each cake takes many hours but all have to be done right before the cake goes out. Sometimes you can make it ahead of time, but for the most part, everything is done one or two days in advance, since everything is baked from scratch and has to taste as great as it looks! Elisa can usually be found baking at Confetti Cakes, 102 West 87th Street. www.confetticakes.com, and can make a cake in any shape you can dream of.